WHY DO CITATIONS MATTER TO YOUR BUSINESS IN 2016? What is a Citation? A Citation is the mention of your Business anywhere on the Web predominantly Name, Address and Telephone or (NAP) for short, with or without a link back to your website. Why is this Important? Citations are one of Main Ranking Elements that Google will use when deciding where it Ranks your Business in the Search Results. For example, if you have two slightly different version of your Name, Address, Phone Number search engines could view this as two separate companies which essentially halves your web presence. As you can imagine, if there are 3 or 4 versions of this info on the web, the problem gets worse and worse. Consistency is Key! To gain extra SEO value for your Business from Citations it is important to display the same Name, Address and Telephone you use on your Website or wherever you are Listed Online. Citations do not require a link back to your site in order for your Business to gain SEO juice but if there is differences in how your Name, Address and Telephone is displayed on the Web then Google will not be able to attribute the SEO value to the right NAP. Check your Citations for Free! 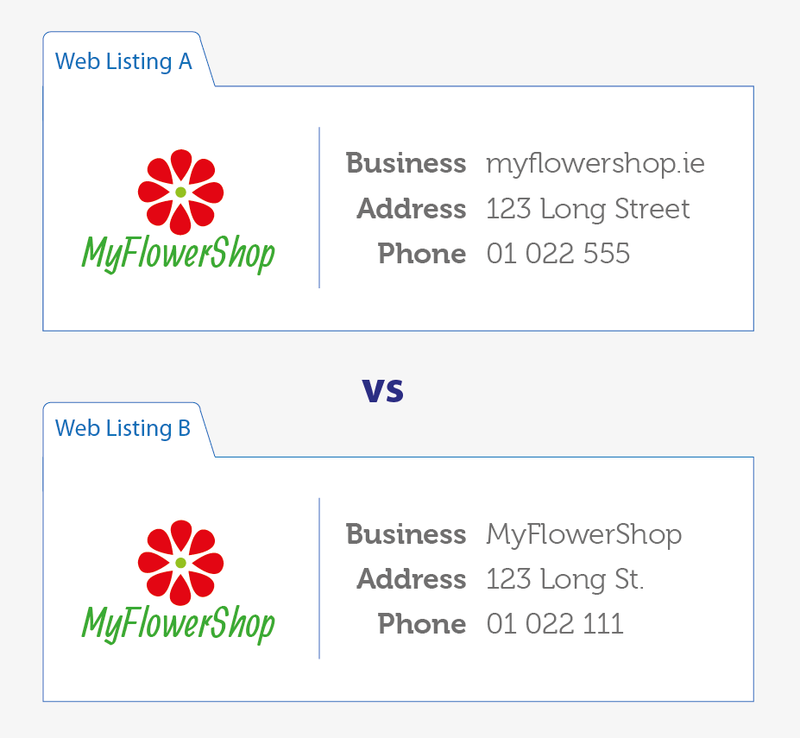 Here’s an Example … Let say you are Florist in Dublin with two Listings – one on Directory A, and another on Directory B. To a user this is accurate as it correctly identifies your Business but to a Google Bot it is not! On Directory A your Business Name is actually your Web Address but is not clickable and also the phone number on Directory B is different. Google would not be able identify that these Two Listings relate to the same Business. Quality over Quantity! The more High Value Sites that you List your Business on the more people will see it and contact you. For example Google would consider a Listing on Established Directory sites like GoldenPages.ie more valuable than a Listing on Random Website used to build links. Quick Fact! 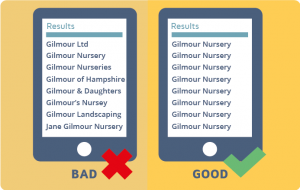 73% OF Customers don’t search for your Business again if the get the wrong information. In a busy market place what makes one petrol station, one B&B, or one cafe stand out above another? Up to 80% of local searches on mobile devices result in purchases. - Copyright © 2018 - FCR Media - All rights reserved.